I was obviously intrigued by the title of this Abigail Reynolds at Seventeen Gallery. It sounds like a book for children, pictures supposedly being easier to understand than text. It also draws on quite antiquated systems of knowledge or representation, like guide books compiled by benevolent yet patriarchal authors establishing the “definitive” perspective on their subject. Reynolds approach was as advertised, a collection of images, (and also texts) an exercise in archiving and categorising images and information, but one that also attended to the physicality of information, the thingness of the books, there ability as physical objects to become platforms, towers, right-angles, as well as holders of secret knowledge. Some of the images were arranged according to visual correspondences, a circular tree truck, a crop circle, a record player, the Men-an-tol stone. 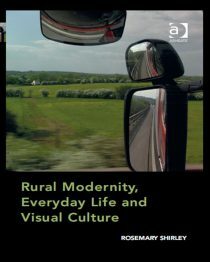 While others were combined with sheets of textured glass, distorting or obscuring any unproblematic/uncritical absorption of “the countryside” through an image. Clearly there is also some ground around modernist sculpture/architecture being explored – are the plinths made of asbestos? There is a sixties aesthetic in the design of the plinths and the muted colours of the images used. The images do confound expectation, in that many of them do not directly relate to the countryside. There maybe some idea of the countryside as a venue for utopian experiments perhaps? (related to the architectural experiments detailed in some of the books Reynolds has selected). I do not think that this work really explores or challenges how the British countryside is represented, rather it is concerned with our relationship to knowledge, how is it accumulated, what types of knowledge are their, how is meaning attributed and who is in charge. This new body of work by Abigail Reynolds is a series of assemblages that combine objects and images, books, glass and metal. The exhibition title alludes to the genteel illustrated publications from which some of the source material is taken, but the countryside pictured also extends to include modernist architecture of the fifties, festival culture of the seventies, protests at Greenham Common in the eighties and rave culture in the nineties. As well as showing individual pages, Reynolds has collaged entire books together within works. Here, she uses the meaning of the whole book, deploying it both structurally and symbolically, allowing it to represent its own historical moment. In some cases multiple bookplates are rebound into another volume, and several works involve glass to crop or alter an image. Although many of the images picture a key historical moment, the works also ask the viewer to direct their attention to the modes of printing and layout, as these formal decisions carry their own freight of cultural meaning and belonging. The imagery and publications used in this body of work focus on various idealized or nostalgic notions of Britain, produced by very different agendas and ideologies. By grouping together several attempts at a British arcadia, the impression is given of a continuous, integrated striving, though Reynolds perhaps hints that their greatest commonality is a certain degree of failure.